Ever since our inception, we have explored several emerging and untapped possibilities in the market. Our thirst for innovation has led us to manufacture using other metals like Steel, Stainless steel, Aluminium & Copper besides Brass. It has helped us earn the status of a one-stop-shop as well as cut a competitive edge in the industry. Among the critical advantages that work in our favour is the location & logistics factor. 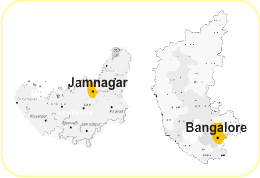 Both the units at Jamnagar and Bangalore are ideally situated to reap the benefits of strategic location. Accessible by road, rail and air, transportation is easily available. This makes it possible to bring in raw materials and ship finished product to destinations world-wide keeping the lead time to the least. 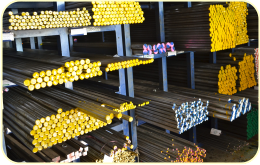 Procurement of raw material is the first stage of manufacturing and is therefore of paramount importance to source the right material. Easy accessibility and reliable quality are vital components to support the functions. Paloma's units are located at places which are renowned for their abundant and rich resources of raw material be it brass, steel or stainless steel. Thanks to the easy availability of raw material, we have always been able to have a smooth, stoppage-free production process. At Paloma, we believe that the success of an organisation can only be propelled by the power of its people. Our efforts are directed at inducting the most competent technical personnel. We work towards keeping our tech manpower attuned to emerging industrial trends so as to continually enhance their professional development. With technically adept skills, our team is constantly striving to take Paloma to greater heights.